The river Bela flows from Overthwaite in Cumbria to the Kent estuary in Arnside; as it passes through Beetham, it cascades down a natural weir created by a fault line, which powers the wheel of the fabulous 18th century Heron Corn Mill. The current mill was built in 1740, however there has been a mill on the site since 1096 or even before. Heron Corn Mill was a commercial mill all the way through until 1952, when W and J Pye animal feeds ceased operations there, and for some years was used for storage. After being bought and then restored by the Beetham Trust, the Heron Corn Mill opened its doors to the public as a heritage centre in 1975. As well as being open to visitors 11am- 4pm, Wednesday to Sunday for most of the year, the mill is a hub for the local community: the Bread of Heron group meets in the mill once a week – milling flour; and making, baking and eating bread; volunteers are available to give one to one training sessions on use of the internet and social media on site; and local theatre group Thresh and Ply put on regular performances inspired by stories and anecdotes from the mill’s archive and library. The mill was serviced in 2007 by Martin Watts, a traditional millwright from Devon, and has since been fully operational: milling wheat, rye and spelt flour for sale in the Heron’s barn; and hosting tours and demonstrations for individuals and groups. Stuart Hobbs is the Heron’s millwright – he started out at the mill as a volunteer, but after the maintenance work in 2007, the Heron needed someone full-time to conserve, operate and demonstrate the mill. From the beginning, Stuart wanted it to function as a working mill, not just for heritage demonstrations. The Heron Corn Mill was originally built to process local oats. Now Stuart mills organic wheat and heritage grains, which are naturally more disease resistant, meaning they don’t need to be sprayed with chemical pesticides. As well as increased disease resistance, heritage grains are easier for our bodies to process, so help with intolerances. The mill itself is almost as it was in 1850 and much of Stuart’s work relies on his experience and intuition, the sound of the mill in operation and the feel of the grain give him the information he needs to adjust the machinery to get the perfect flour. The different grain varieties all need specific treatment, which can also vary according to the growing conditions and whether the grain has been stored for an extra week or two. The mill works by taking water through a sluice gate at the top of the weir into a channel called a launder, through which it rushes under the floor of the mill to the water wheel. The wheel generates power to operate the millstones, which grind the grain. After each operation, the millstones and all the mill furniture is removed and any remaining grain or flour is vacuumed out to guarantee hygiene. The millstones require regular upkeep to ensure their ‘dress’ – a series of grooves carved into the stones to grind the grain correctly – is maintained. 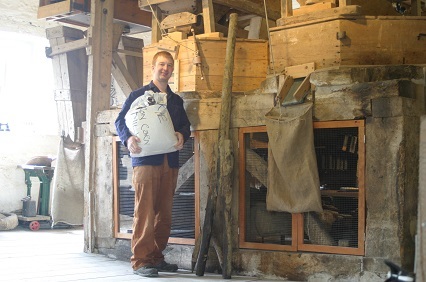 The mill is open to the public to look around Wednesday to Sunday 11am-4pm for most the year, and is operated for public demonstrations on the first Friday of the month, making spelt, wheat and rye flour – which is available to buy in the Heron Barn, along with teas, coffees and souvenirs.